The weather was much better on day 13. Before we left the holiday park in the morning, we talked to one of the managers. Andrea and her husband have been managing this park for eight years. I asked her what they enjoyed about it. We love the fact that we can actually work together. We’ve always worked together, so working out here in this environment, it’s just great. So we’re still together. Plus our kids love it. And the fact that you’re, you know, you’re only, sort of, 20 minutes from the city, yet, you’re still in Christchurch, which is … the location is perfect. People. We’ve met so many cool people, we’ve made so many cool friends. And our kids have made good friends, too. I mean they’re … Carson’s nearly 20 and Courtney is 17. They’ve made some good friendships out here. It’s a great family place to live. We drove into Christchurch to find something to eat and have a look at more of the city. We had lunch at the Dux. The Dux de Lux has been around since 1978. I had some great meals and nights out here in 99. The food was superb. We also had a look inside a few of the shops and galleries at the Arts Centre. And then walked to the Square. Cathedral Square was full of people enjoying the sunshine and a kapa haka performance. We’re going to finish our performance off now with a traditional chant. I hope you all enjoy it. Thank you all for your donations. Tēnā koutou. Here's my attempt: Haere mai ra te kino te tangata tau ana te whakaaro e ta puta mai …. o te wairua na ra te puhoi …. And we saw The Wizard. The Wizard was born in England in the 1930s and he’s been entertaining people in this square since the 70s. He was made the official Wizard of Christchurch in 1982 and in 1990 the prime minister appointed him the official Wizard of New Zealand. And also, even more importantly, men are in this world to be blamed when things go wrong. Women never blame women. And ask yourself why they never do. Because deep, deep down they know they shouldn’t be the boss. They know it bloody deep down. But if you give em an inch, they’ll take a bloody mile. They’re like spoilt children. We left Christchurch and headed south on State Highway 1. 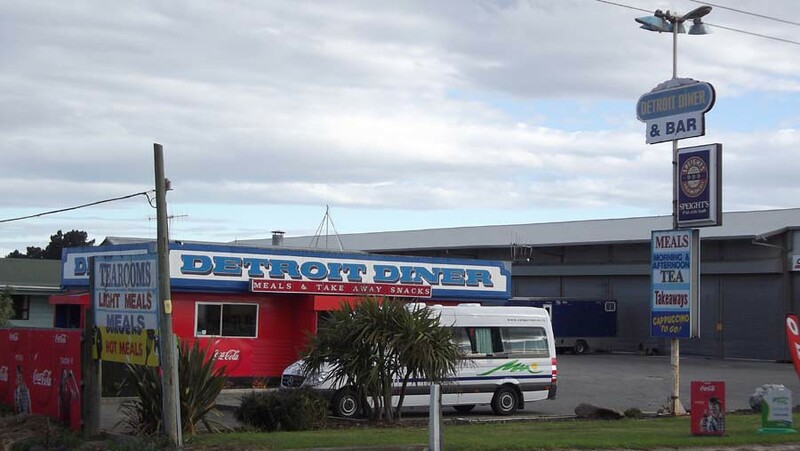 We thought about stopping in Timaru for coffee, but everything seemed to be closed. They had some nice Christmas decorations though. We also thought about stopping here, but it was closed too. We eventually found a place that was open, the Detroit Diner. I remember stopping here once when I was hitchhiking and I caught a lift with a truck driver. That night we stayed by some famous rocks called the Moeraki Boulders. It was another place we could stay for free with our Native Parks membership. I think the boulders are really beautiful. Especially at sunrise and sunset. I think the kapa haka group we saw may have been Te Mana o Mareikura. Te Mana o Mareikura on Facebook.